Gaj Singh is the son of the last nobleman of Alsisa, Rajasthan. Born in Jaipur, he was in the army before launching his hotel business. 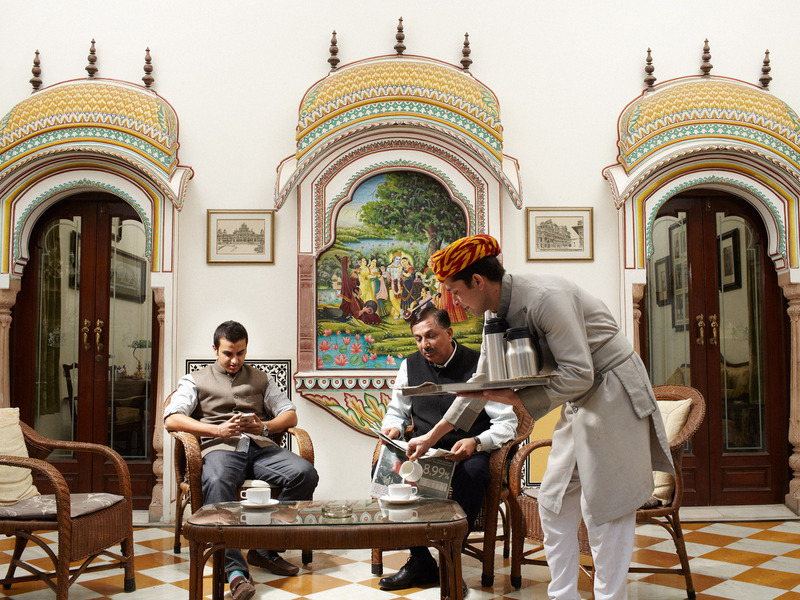 He now owns three hotels in Rajasthan, two of which are his family residences converted into heritage accommodations. He is married, has two sons and lives in Alsisa Haveli, his hotel in Jaipur. "We had so many people working around us […] but gradually it faded and by the time I was passing out of school in 1976, we didn't have many people working for us, but again, with this present business […] the bygone era has come back." Originally from the northeastern state of Arunanchal Pradesh, Dibang is a well-known TV journalist and news anchor. He lives in South Delhi. "I think traditionally in India money is supposed to be bad. If you're rich that means you've done something wrong, so even if you're rich you would never say I'm rich, […] you would always underplay it, it's a strange thing that happens here." Colonel Kuldeep Singh Garcha, a businessman, is a retired national polo player and army officer. Originally from Punjab, he lives with his wife in Jaipur. His son, also a polo player and a businessman, lives in Singapore. "You know there are two things in life, ambition and desire. I let my desires run wild, because whatever I achieved I feel happy about [...]. But if you are ambitious and from 0 to 10 you reach 8, you still have a negativity [because] you haven’t got that 10. So I'm not ambitious, I desire, I desire the stars and if I fall short I'll probably land at the moon." Ganesh Singh-Jhabua, a member of the former royal family of Indore, is a businessman. He has two daughters, both of whom moved away from their hometown after marriage. He lives in a property just outside the centre of Indore with his wife and their great dane. "It was very difficult for a person with my background to compromise that old royal style which I'd learned when I was a kid [...] to start something new, a business, [something] which my forefathers had never done. […] In my grandfather's times a businessman was not [considered] a moral person - that's what I'd learned all my life and from there to get down and do the same thing [business] was difficult in the beginning. Then I started enjoying the work." Karan Talwar is a businessman from Delhi running one of his family enterprises dealing in automotive parts, the electronic industry and mining. After the completion of his business degree in London he moved back to Delhi where he built an apartment for himself in his family home. "I've already seen salary hikes in the workers' wages, the minimum wage in the state we operate in keeps jumping up. [But the] monthly wage of an Indian worker is so different from an American worker, that gap is so wide that it's going to take a couple of decades to catch up, and [even then] it won't, because the cost of living in the US is increasing too. It's a cycle, because if our cost increases [and] they are buying the same products from us, we pass those increases to them, and their cost of living is going to up as well, so that gap is always going to remain." Originally from Singur, Karanvir Singh Sibia, "Sunny" to his friends, lives in Chandigarh with his wife, son and daughter in law. He started his first stud farm in the 1980s on his family’s land in Jind and recently opened a second in Roper. Eight years ago, after his son came back from Australia, where he studied and lived for seven years, he started with him a real estate development company operating in Chandgarh and surrounding areas. "One would like to see more industry growth because we are seeing a lot of our younger generations migrating to other countries, so if there are better job opportunities back home I'm sure they would rather stay back and try and avail of some of the benefits that would come about." Bombay born Kavita Sanghi, wife of late industrialist and businessman Satish Sanghi, lives in Indore in a house designed by Eckart Muthesius, which originally served as the servant quarter for the maharaja's palace. She runs a textile business and, together with her son who owns a home next-door, they own nine male pedigree dogs. "It was me who started with the textile business since my children had grown up and [...] I had all the time to myself, so I told him [my husband] I want to start this. He didn't like it in the beginning because most women of India’s upper class at that time weren't open to work, [but] I said 'but I don't like sitting with ladies all day and just talking about household affairs, I'd like to start designing.'[...] So then he agreed to it and supported me right through." Daughter of an astrophysicist, Nikku Guron is an interior designer from Chandigarh. She runs her own studio, is married and has a daughter. "For example when we were kids it's not like we had a/c in all the rooms, now [...] these kids are not used to it, they can't even dream of a room without an a/c. When you become more comfortable you just thank god […] I think we're really privileged that god has been so kind, [...] because we’ve seen those days and the way things have changed." Percy Billimoria is one of India's most successful corporate lawyers. Originally from Bombay, he has been living in Delhi for over twenty years. He lives in a farmhouse in South Delhi. "I grew up in an India which suffered from a miscarried socialism. I am a free market proponent, […] I believe that the market sorts itself out; it's not to say that there's nothing wrong with the way free markets work, it's not a perfect model, but ultimately market forces are the best solution to the problems that market forces themselves create." Rajat Sodhi is an architect. Born in Delhi has studied and worked for several architecture firms the UK and Europe for ten years before returning to India to start his own independent practice. He lives in South Delhi with his sister, an art curator. "The service class who does work for the upper class, it's only a matter of time till they realize how badly they are being exploited and how badly they are being economically manipulated. [...] This is a structure that is somehow geared towards breaking down in one way or the other, that may be in form of a social revolution or of something more violent, or it could be something that kind of gradually changes." Rohan Jetley is a businessman. Born in Delhi, he's lived with his family in Bombay and Singapore before moving back to the capital city. After graduating in Hawaii and working for Marill Lynch he moved back to India and manages T.G.I.F. India, one of the family businesses. "Before, unless you were educated and unless you came from a certain background and you had certain contacts, there were very little chances to make it. Today, because of the corporate structure that exists it's all merit-based, so if you work hard enough and you're a diligent and intelligent person you inevitably make it to where you want to go." Sheel Chandra, together with his late twin brother, started the one of the biggest pashmina, wool and carpet businesses in the country. He was born in Shimla (Himachal Pradesh) and lives in South Delhi. He's married and has four children. His brother, who married his wife’s twin sister, has three. "The distribution of money is not good in India. Still, one third of the people in India live on one dollar a day, maybe more than one third. Some people have so much money that 5% of the people are the richest people in the world, 10% are very very rich, 20% are still very rich. We would be one of those 20%, I think." Sukhwant Singh is a steel industrialist. He owns a plant on the outskirts of Indore and manages two Tata Steel factories, in Baroda and Sri Lanka. Once leading a much bigger industry, he had to reduce the size of his business due to an infrastructure-generated crisis, but is now again in a growing phase. "The disparity is so visible, it's so obvious. How does it look if I'm driving a Mercedes and another guy doesn't even have a bicycle?" Recently India has been portrayed as a booming economic powerhouse. In the final month of 2011, India’s GDP growth rate was 4 percentage points higher than that of the USA and just 2 points lower than that of China. India’s 7% GDP represents the story of 1.3 billion people waking up from the nightmare of under-development and poverty, of a growing middle class populating the most crowded cities in the world. It’s a story of movement, change, and increasing possibility. Yet, the images coming out of India rarely portray the citizens who benefit from this growth. This discrepancy gave rise to The Seven Percent. First came a journey—from New York to Delhi, and then on to Indore, Chandigarh, Jaipur. And from that journey was born a series of portraits, still lifes, and interviews representing a selection of people who have been— each in his or her own way—riding India’s wave of growth. They are businessmen, professionals, ex-nobility. Each has a different lifestyle and values, but all look ahead, with great optimism, to the opportunities India’s continued progress will afford them.